Midland-ACS 3/2 pad (to pull) spring return with pilot and manual latch spool valves in stainless steel for use on gases. 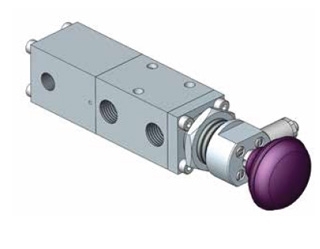 If a pilot pressure of 1.5 to 10 bar ( 21 to 145 psi) is present at pilot ports when the knob is pulled out, the pilot pressure will hold the valve in the operated position against the return spring. Alternatively the valve can be mechanically latched in this position if no pilot signal is present. When a pilot signal of 2 to 10 bar (29 to 145 psi) is applied this will simultaneously allow the latch to release whilst holding the valve in the operated position the valve will reset to its unoperated position. The valve cannot be operated by pilot pressure alone, manual.